Police have confirmed that the motorcyclist killed in a hit and run accident was a 63-year-old man from Dunmow. He died after a dark coloured small vehicle was in collision with his Suzuki GSF at around 5am. The victim was wearing a distinctive helmet with green and white flashing lights at the time. "We are reviewing dash cam footage and have spoken to a number of key witnesses, and are continuing our enquiries to find the other vehicle involved in this collision. “It may well have damage to the driver’s side, possibly a dent or scratches to the paintwork. I urge anyone who has seen a vehicle matching this description or has any information that could help us identify the driver to contact with us." 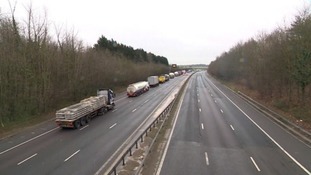 Essex Police have re-opened lanes one and two of the northbound M11 between J6 and J8 following this morning’s fatal collision. The southbound carriageway remains closed while officers investigate. The force said: "We only get one opportunity to identify evidence at the scene of a collision and preserve it so we need to be thorough but we are working to get the road open as soon as possible."